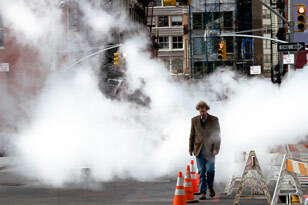 Sense and the City is New York as experienced through the five senses—a nifty idea for a blog. More posts, please! Josh Rogers says that even though NYC is a fashion capital, "if you're under 5' 8" it can be surprisingly difficult to find stuff that fits." And so he started Shortshrifted, a site that tracks down clothes for shorter guys. Some of suggestions on the Things You Should Have Been Told… Before You Moved to NYC thread are boneheaded, but "avoid walking on cellar doors as much as possible" and "don't pick up 'female' prostitutes between 14th and 30th Streets on the Westside" seem sensible enough. We can imagine a better local version of this, but Apartment Ratings still may offer some useful tenant feedback if you're looking to rent, particularly in a larger building. White Trash BBQ is "the story of a fire obsessed guy, living in Brooklyn, with a dream of producing award-winning, competition-busting, real Barbeque." We find NYC maps irresistible, and there are some keepers from Adrienne Ottenberg, including a Hot Chocolate Map and a Manhattan Poetry Map. Artlog is an ambitious site about all things art-related (from exhibitions to parties), news, jobs, and forums. Nextbook's festival of ideas "Jews and Power" will take place on Sunday, May 18th at TheTimesCenter, 242 West 41st Street from 11 a.m. to 5:00 p.m. The all star line-up includes Shalom Auslander, Leon Botstein, Aaron Miller, Cynthia Ozick, Ruth Wisse, Avivah Zornberg, and others who will explore how Jews negotiate their relationship with power.